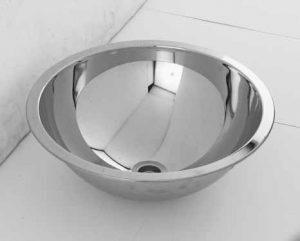 Undermount Stainless Steel Wash Hand Basin, 404 x 318 x 130 mm. Unit to be manufactured from Grade 304 (18/10) Stainless Steel, 1,2 mm gauge. Bowl size 360 x 280 x 130 mm deep with a 22 mm flanges all round and 40 mm waste outlet. Tap and plumbing not included in product code. Grade 304 stainless steel contains high amounts of chromium and nickel and is the most corrosion resistant, ductile, and weldable type of stainless steel. It is used mainly for heavy duty work in commercial and industrial applications where durability and hygiene is of utmost importance. These basins are ideal when installed in shopping malls, schools, clinics, hospitals, doctors rooms, factories and more. They leave the top surface smooth so cleaning is easy. The taps can either be deck mounted, so you need to drill a hole in the granite or wall mounted. We recommend using water saving metered taps in public spaces such as malls and sports arenas and even factories as well. 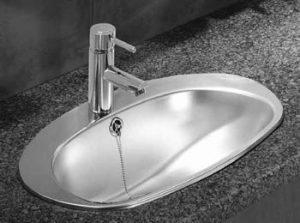 The metered taps will close between 8 – 20 seconds depending on setting. We do not recommend using demand taps as you have to keep pressing the taps button for water to run. You cannot use the basin with melamine or wood surfaces, as found in many laboratories. 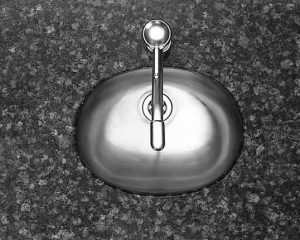 The two inset stainless steel basins below requires similar installation. Both are made from the same quality grade 304 stainless steel.